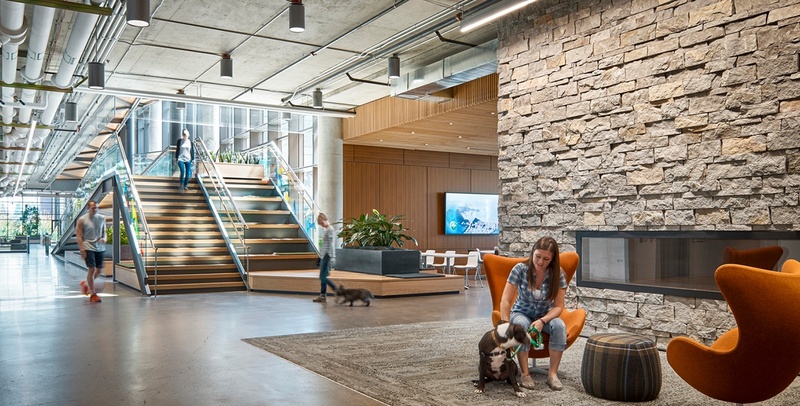 The new corporate headquarters for Banfield Pet Hospital is not only the most dog-friendly office in town, it also only requires half the energy of a typical office of its size. The LEED Platinum certified building was designed as a contemporary and dynamic workspace for over 600 corporate employees. While Banfield is a large company, the office’s energy is reminiscent of a start-up. Much attention was allocated to both the functional and creative design. A few of the long list of strategies Interface designed include a geothermal water-source heat pump, a data center heat recovery system integrated into the domestic hot water/condenser water loop, thermal solar domestic hot water, 20-thousand gallon rainwater harvesting system, interior and parking lot LED lighting, daylighting controls, ultra-high efficiency transformers.